That has changed with the new OptiMate Solar line that features a smart charger-monitor which provides battery status information around the clock, when it is charging the battery during the day and when the battery is at rest overnight. 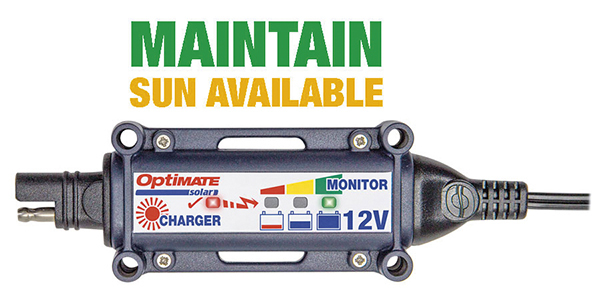 The OptiMate Solar TM-522 smart charger-controller is ‘the ‘brain’ in the new line of OptiMate Solar modular charge kits. The 4-LED panel on the TM-522 smart charger-controller provides comprehensive information on charge progress and battery status. When the panel receives sun, the SOLAR CHARGE light blinks, confirming solar power is being delivered, and one of the three battery status lights indicates charge progress. When night falls, or if the smart charger-monitor senses no solar power is being delivered, it changes into a battery monitor, with one of the three charge status lights now indicating battery status every three seconds. The 10W TM-522-1 (12V 0.8A max.) and 20W TM-522-2 kits (12V 1.6A max.) are said to be ideal for all powersports vehicles. 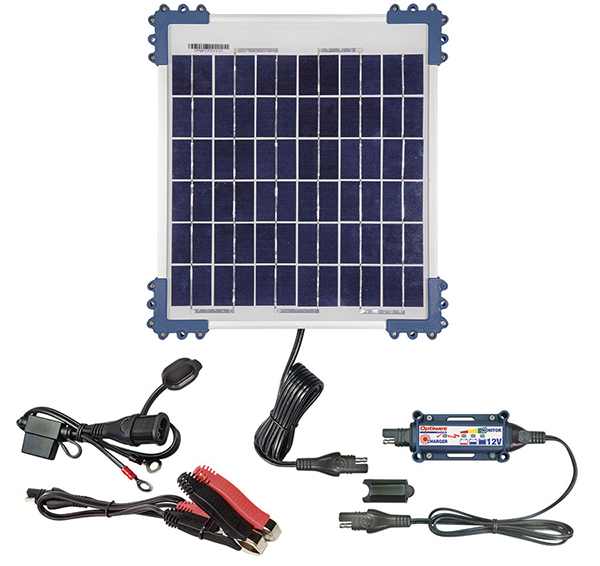 The weatherproof solar panel includes corner mounts for easy wall or roof mounting. Each kit includes a high intensity poly crystalline panel with a 2m/80” power cable, an OptiMate O-01 weatherproof battery lead, an OptiMate O-04 set of battery clips and the outdoor rated OptiMate smart charger-controller (TM-522) with a 1m/40” charge cable. If more power is needed, there are also the higher power 40W (TM523-4), 60W (TM523-6) and 80W (TM523-8) kits that include the higher power rated TM523 charger-monitor.